Bart started as a Cub here then left to grow up, but it didn’t work so he came back. 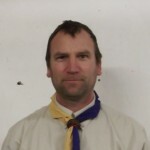 In his apprenticeship phase, Bart worked as a parent helper assisting previous Akelas, then an occasional helper and then an assistant leader. In the ‘real world’, he’s done lots of lively outside work from crab fisherman to motorbike courier to roofer, although these days he’s playing it safe as a water softener engineer in a local family business. 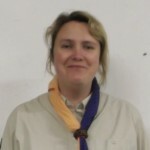 Claire got involved with Cubs after being begged by her eldest son to help “as they needed more girls”. She came along as a parent helper in 2013 and was hooked. Away from the hut, Claire is an Environmental Health Officer managing the pest control team for Wiltshire Council. Her Scout name means rat! Most likely to say: Shall we have some hot chocolate?